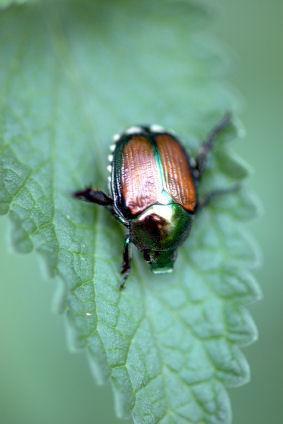 For gardeners bothered by these pests, they are left wondering, "What eats Japanese beetles?" There are a few creatures that will eat these pervasive bugs, both in their larval and adult stages. The following methods will help you in your quest to rid your garden of Japanese beetles. The area you live in will largely determine which method you use to control these pests. Ducks eat Japanese beetles. If you live in a rural area you can use this pesticide free method of ridding your garden of the beetles. They will eat both the larvae and the adult bugs. The downside to having ducks in your garden is that they will trample young plants and sometimes eat them, as well as digging through your mulch in search of bugs and slugs. Ducks are easy to care for if you have the room. They will require a four-sided fenced in enclosure, and some breeds need to have their wings clipped so they won't fly away. Most ducks will also want somewhere to swim each day, such as a chlorine free pool or a man made pond. Milky spore can be sprinkled on the ground in your garden. Milky spore is a bacterial disease which infects and kills the larvae. Since the bacteria are pervasive, they will reproduce and continue to kill larvae for up to 10 years after the initial application.Unfortunately, milky spore is ineffective against adult beetles. For rural areas where the beetles are found in numbers, milky spore may be an ineffective means to control them. Nematodes will attack and kill the grubs or larvae, but they can also have a negative effect on many garden plants. Most people won't knowingly introduce nematodes into their gardens unless they hate squash and potatoes or don't want to garden in a particular area anymore. The gregarine is a parasite that kills the Japanese beetle in its native surroundings in Japan and Korea. This form of control has been studied in the United States, but it has been found largely ineffective because the adults can easily fly in and out of controlled areas. Even if you know what eats Japanese beetles, you may not have the methods suggested at hand. In this case, one of the easiest methods to get rid of the beetles is to hand pick them from plants and put them in a bucket of soapy water. The soapy water will keep them from flying and they'll eventually drown in the water. Japanese beetles are attracted to the most fragrant of plants, usually roses in your garden. They will tend to congregate in numbers, and thus attract even more of their kind. This will make it easy for you, at first, to collect them. Vigilance will result in the big pay off. As long as you check for them each day on your plants and dispose of them in the soapy water, you'll definitely notice a decrease in their number and the amount of damage to your plants. Many gardeners and commercial nurseries have found that the soapy water method is one of the most effective ways to get rid of the Japanese beetle. When you use pesticides, such as Sevin, you will have to spend time mixing and preparing the pesticide, spraying it and cleaning up afterward. In the process you'll also kill some beneficial insects. For this reason, many people find that the soapy water is the least expensive and fastest method of dealing with the problem. Professional grade traps are also effective ways for dealing with the beetles, but they work best for gardeners or nurseries that have acres of plants. Otherwise, for a small garden, the beetles will tend to zone in on their favorite plants and avoid the traps altogether.